It's officially Autumn/Fall which in TV terms means new seasons and cheeky new pilots! As a huge TV buff so I'm always looking for a new show to start or am sat patiently waiting for the next season of my favourite show to come back - this year is no exception. As I know, a lot of you girls and boys are huge TV lovers like myself so I thought what better than sharing my top TV picks for this season. I had been waiting for this show for MONTHS. The cast and promo photos had me sold before I even knew the plot. I'm a huge Ryan Murphy fan (Glee, AHS) and knew with the likes of Emma Roberts and Ariana Grande being cast this would be a total hit. After watching the 2 hour premiere and episode 3 I am HOOKED - it's funny, bitchy, gory... the script is just genius, I can't wait to see what happens. Oh my goodness, I had nearly forgotten about this little gem, it has been so long since season 1! Holy macaroni, the twists and turns this show takes are insane - I'm pretty good and guessing a storyline but this has had me shouting 'What?!' 'Noway?!' and the screen more than once already then season.... and there's only been two episodes! If you haven't seen this masterpiece yet then I suggest you go ahead an start it - Viola Davis just won an Emmy for her performance don't ya know! Yes it's a Kardashian spin-off. SPOILERS written ahead! Don't read if you aren't upto date! Oh lala! Disney and fairytale fans rejoice - Once Upon A Time is back and this season Emma has gone baddddd! Yes the savior is now the dark one and this season is going to be totally different to anything we've seen before, I'm really looking forward to seeing a different acting style from Jennifer Morrison. If you haven't seen this show before then it's all on Netflix and they upload new episoes weekly straight after they've been aired in the US! Last but not least..... something we have all been waiting for! Season 5 of American Horror Story, the only show that hasn't quite started yet. Hotel. Lady Gaga. It's happening. I'm praying this turns AHS around for me - I'll hold my hands up and admit I wasn't a big fan of Freakshow, for me Aslyum and Murder House have to be the best seasons. Once again an awesome cast lined up and I'm sure some fantastic writing! Bring it on. What shows are you looking forward to this upcoming season? Will you be watching these with me? 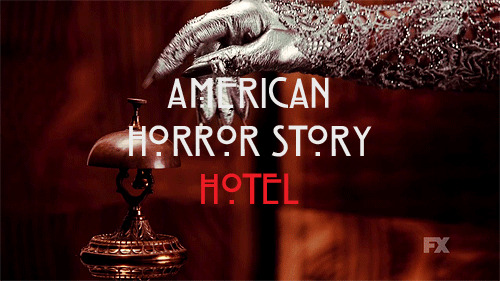 I cannot wait for AHS! I'm sad that Jessica Lange won't be in this series though. Ahhh we have such similar taste!!! I'm still in disbelief that one of my favourite ever popstars is going to star as the lead role in one of my favourite all time TV shows!! The excitement is unreal!! I've seen gifs of Scream Queens everywhere but have yet to actually watch it myself. The other TV show I've been excited for is Season 2 of Empire! I cannot WAIT for AHS!! I am really hope this season breathes life back into the show. I wasn't a huge fan of Freakshow or Coven :( But I'm stoked about the cast! I don't watch much tv kind of girl, but I'm more of a action and fight scenes kind of girl. I love Arrow and The Flash. Looking forward to Scream Queens and the return of AHS! Really want to watch How to get away with Murder now too! I LOVE Once Upon A Time, that's my favourite! Can't wait for AHS too! I love this time of year because of the tv shows and I'm so excited to catch up on scream queens and really need to watch OUAT. Thanks for sharing some new ones including dash dolls which is something I love watching in the background while getting ready. I don't get much chance to watch TV anymore, working all the time (and in the cinema)...it's all about the movies at the moment. But I LOVE Modern Family & really need to catch up with Once Upon A Time...Scream Queens does look amazing too, my next free time I'll make sure I'm watching it.